Your logo is the most common available avenue to be seen as a business. It’s simple. It’s recognizable. It sticks in your customers’ minds, and might just get someone to pick your product off the shelf ahead of a competitor they don’t know. Above everything else, it can appear in a lot of different contexts. If you look around for just a moment, the chances are very good that you’ll see a lot of logos. Your computer, your phone, your shoes, your shirt, a car, a billboard, a building—wherever you are and whatever you’re doing, there’s bound to be at least one logo. They’re everywhere. So when you’re thinking about your business’ own logo, where does it appear? Where are you being seen? Where should you be seen? When you engage with a business, there are certain places that you’re going to expect logos to show up. These are the must-haves, the locations where you’ll look, well, incompetent if you don’t have a logo or at least some kind of wordmark. For example, the first thing someone sees when they land on your website is probably going to be your logo. It might be at the top left of your main menu bar, or it might be at the center of a large banner image, or it might be somewhere else altogether. Look up at the top of this page itself—you’ll see Element Three’s logo, there at the left, in a place of honor. Scroll all the way to the bottom, and you’ll see a secondary logo (our favorite elephant) centrally located in the footer. Fig. 1: Element Three's homepage, with logo prominent. When you hand someone a business card, your logo is going to be somewhere on there. Maybe it’s at one side, above or below your name. Maybe it’s on the back of the card. It’s on your letterhead. It’s on your front door, or above your receptionist’s desk. These are the simple, obvious places people are going to see your logo. Basically every business uses their logo in these ways, so you’d better be doing it too. In 2017, basically every business is using social media, and again, that means you’d better be there too. And so should your logo. You have a space on your Facebook, Twitter, LinkedIn, and other profiles for a profile picture. Your logo needs to be there, in one way or another. Fig. 2: Element Three's social profile images, displaying the primary logo. You can also work your logo into your banner or header image if you like, especially if you want to switch out your profile image on occasion to replace it with something seasonal like a holiday image, or even an advertisement for an event or a sale. But whether it’s in the header image or the main profile picture, you’ve got to have your logo in a prominent spot on your social profiles. Everything we’ve talked about so far is something that most, if not all, businesses will share. If you don’t have business cards or a Twitter account in 2018, you’re going to find yourself outside the mainstream. It’s pretty obvious that you should make sure your logo appears in places like that, but there’s more to your logo than the obvious. You may or may not even engage in some of these contexts, but if you do, your logo should be there. Think about advertising, for one. Every business doesn’t advertise the same way—some are decidedly lo-fi, and others incredibly modern. But whether you’re buying space in newspapers, hitting billboards and park benches, or leveraging the power of Google’s digital presence, you should—space permitting—take the opportunity to include your logo. It may seem obvious, but once you’ve gotten in front of someone and exposed them to your brand, ensuring they remember it is critical. If you own your own space, or you rent in a building that’s exposed, you might even be able to display your logo externally. This is especially great if your business thrives on stop-in business. If someone knows your business, or if your logo conveys what you do well, it just might drive conversions on its own. If you find the right opportunity, your business might even consider sponsorship—of an event, of another organization, or even of a sports team. Your logo could find its way onto banners at a jazz fest, on the back of a conference t-shirt, or even on the sidelines (or in soccer or basketball, the uniform) of your local professional team. It needs to be recognizable and to fit in with all of these different situations. Practically every business has swag, or gear, or whatever you want to call it—even if it’s just as simple as a polo shirt that has your logo on the breast. But don’t overlook the effect that expanding your swag offerings can have. It really builds a connection between your employees and your business, it supports culture, and it can even help you gain fans outside the organization. Fig. 3: A few items from our "Swag Pack." That expansion means your logo will be in a lot of different places in different contexts—both in terms of where people are seeing it and what they’re seeing it on—and usually accompanied by a valuable brand ambassador, whether or not it’s one of your employees. Once again, this means your logo needs to be versatile. It can’t just look good on a sign, it also needs to look good on a t-shirt—but it also needs to look good on a water bottle, a fidget spinner, a hat, or almost anything else you can think of. Fig. 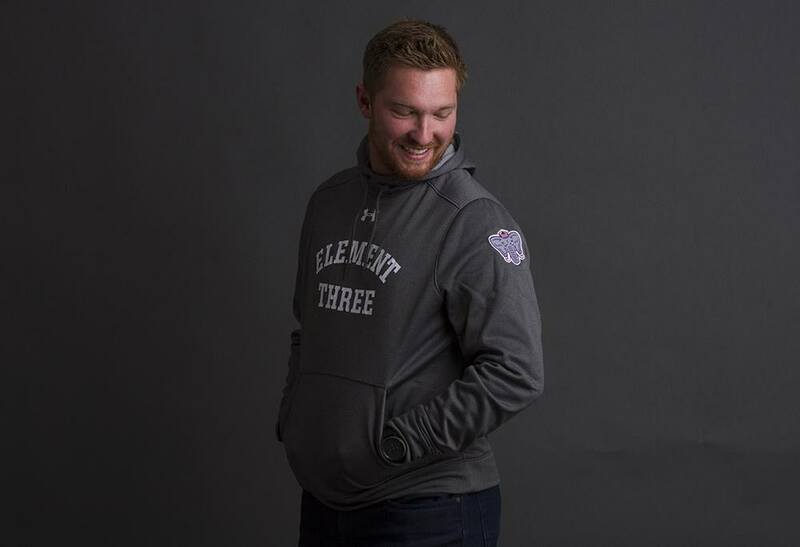 4: The most recent Element Three swag—E3 branded hoodies. This might even be a place where you want to use a secondary logo. 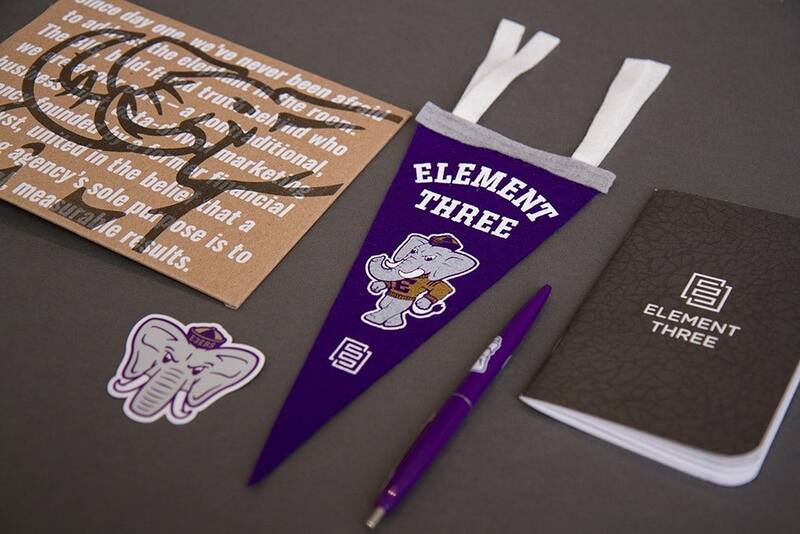 Like I mentioned earlier, Element Three’s secondary logo is our mascot, an elephant that represents “the elephant in the room”—the big, bold truth behind who we are at our core, a nontraditional, business-first, data-driven marketing agency founded by a former financial analyst. The elephant doesn’t just exist in one form, though. We have a less stylized one for more traditional use, like in our website footer (as mentioned above) and on some of our apparel and other swag like notebooks and stickers. But we also have one that’s designed to resemble a mid-century sports mascot, which we use in situations like shirts and duffel bags for our kickball team, and anything else that’s a little more fun or sporty. It’s also versatile for the season, as you can see based on this year’s Santa elephant design. You’ve probably seen people driving cars with bumper stickers of the Apple logo on the back window. That falls more under the umbrella of swag than anything else, though throwing it on a car is maybe another level. But just Google “apple logo tattoo” to see how some people show their devotion to a brand they truly love and identify with. Brand logos can pop up in other places too, like in street art or graffiti. This is especially true if yours is a lifestyle brand—if you own an investment company, I wouldn’t expect any logo tattoos, but if your local boutique shop gets popular, you could definitely start to see your logo and other brand components pop up around the neighborhood. Whether your brand is an international superstar or a local flavor, your logo is going to be one of the most important parts of it, both internally and externally. It lives in a lot of different places—a large number of uses, and a wide variety as well. That means you need to think carefully about what you’re doing when you design your logo. Don’t just create a logo that looks cool. Make sure it reflects your brand, and make sure that it’s versatile—or at least simple—enough to work in the variety of contexts that your logo will be appearing in. And once you have your logo settled, put it everywhere you possibly can. Show yourself off as much as possible. Your logo might not end up in literally 101 places, but the more places you can fit it in, the better off you’ll be.